This is a very cool crustacean fossil. It is a large, split pair Eryma modestiformis from the famous Solnhofen Limestone of Germany. This classic location is well known for the fine preservation of the fossils that are found there. This distinct specimen is fossilized in the textbook outstretched position. The head, carapace, both large claws, and both antennae are intact and easily seen - even some of the legs are visible! The ancient arthropod has great natural coloration, which contrasts well with the dendrite-covered matrix. 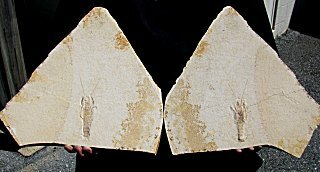 The fossil decapod is well preserved and beautifully displayed on two very large (13 inches across! ), unbroken plates of lithographic limestone. And, remenber, this is a SPLIT PAIR fossil - both halves of the specimen are included together! This is a very collectible display specimen of a pair of fossil crustacean bookends!